These 1300cc. Alfa Romeo sports cars were popular and successful production racers in the 1950s and 60s. "The Red Alfa with the #000 belongs to Dave Mericle from here in the San Diego area - he's in his 70s and still races this car. Dave is a new non- member of the Fab50s. 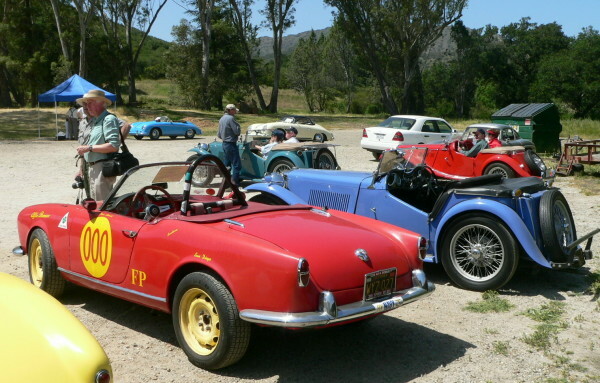 Dave sold his Lotus 61 a few years back to another Fab50s member: Carl McLelland of Sparks, Nevada. My dad sold Alfas from the 4th and Soto shop -- I still recall his excitement at receiving a new Veloce - the Veloce was special: Weber Carburetion." "The Alfa Giulietta at Paramount Ranch belongs to Dave Mericle Sr. He has been a racer for 50 years. His son, Dave Mericle Jr, is a good friend of mine, and perhaps the most knowledgeable person in the US about Alfa Romeo mechanical stuff and parts interchangeability. Dave Jr. lives in Garden Grove. He has been restoring a very early 1956 Giulietta Normale Spider for about 10 years, and when it's done, it will be one of the best in the world. He also has one of the super-rare Alfa Giulia Colli bodied panel vans. Alfa only made a total of 16 Giulia Colli bodied cars, comprised of panel vans and station wagons."